Kimchi is a well-known Korean side dish. I always wonder why Korean people are so fond of this dish and consume it almost everyday. Once I tried, I just fell in love with its complex flavours. Taste-wise, it’s spicy, salty and sour, mingled with a pinch of sweetness and umami. It gives you a cleansing feel. So it’s very suitable for being served as an appetizer. 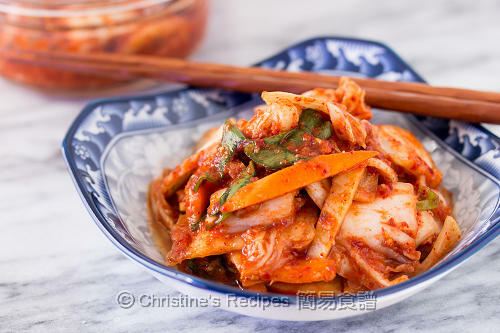 More and more people note that kimchi has great health benefits. As this dish is made by fermented Chinese cabbage (aka napa cabbage), it contains many healthy bacteria, called lactobacilli, also easily found in other fermented foods like yoghurt, so that it helps balance our digestive system. 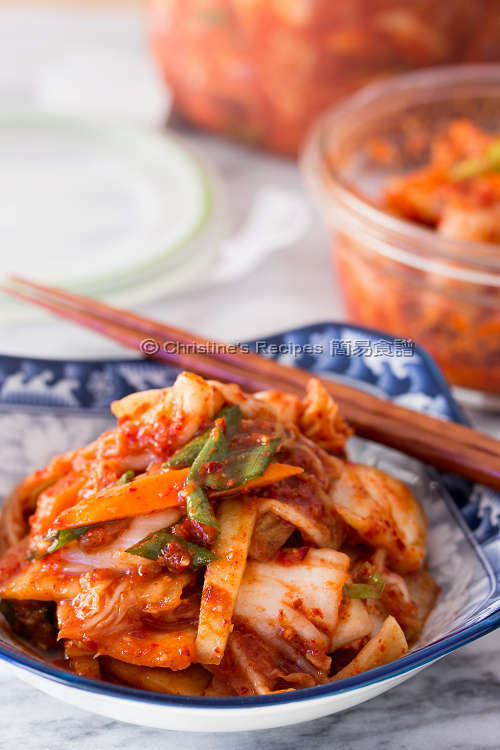 Kimchi is low in cholesterol, yet high in fiber. I can’t name all its health benefits. Having said that, it’s a good idea of not over-consuming any foods even though they are good and healthy. Cut the cabbage and rinse. Cut the carrot and spring onion. Top left: Korean glutinous rise flour. Top middle: cook glutinous rice flour paste. Bottom right: Korean chilli flakes. Top left: mix in the fish sauce with the glutinous rice flour paste, then add minced garlic, onion and ginger. 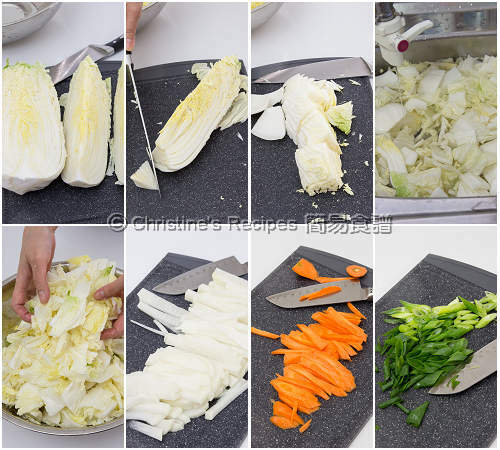 Cut the cabbage into four quarters lengthwise. Trim away the top hard parts. Rinse in water 3 times. Soak in cold water for about 30 minutes. Drain well. Transfer the cabbage into a large bowl. Sprinkle the sea salt evenly. Use your hands to combine very well, aiming at getting every cabbage leaf to be well coated with the salt. You may salt the cabbage in batches if you don’t have a large enough bowl. Leave it for 1½ hours. Turn the leaves from the bottom to top and mix them well every 30 minutes. At this stage, you’ll see some water released out in the bowl. Rinse in cold water 3 times. Taste the cabbage. If you’re satisfied with the saltiness, you can move onto next step. If you find it’s not salty enough, you can still salt the cabbage and let them sit for a little while longer, then rinse again. Or vice versa, soak in cold water longer if they are too salty to your liking. In a small sauce pan, mix the water with glutinous rice flour well. Bring it to a boil. Continue to cook on medium-high heat for about 3 to 5 minutes, until it’s thickened and look slightly translucent. Remove from heat and let it cool completely. Use a food processor to process the garlic, onion and ginger into a paste. Or you can chop them into mince with a knife instead. Add the paste into the glutinous flour mixture. Mix in the fish sauce. Stir in the red chilli flakes. Combine with radish, carrot and spring onion. Put on a pair of plastic gloves and combine the mixture with the cabbage very well. Transfer into a plastic container or a glass jar. Cover with a lid. Place in a cool dark place at room temperature for 24 to 48 hours. The kimchi will develop a tangy taste. That means it’s fermented and ready to serve. Or you might like to chill the whole container in fridge. It can be stored up to 2 to 3 months. Take out a small portion in another container to be fermented at room temperature if needed. There are two kinds of Korean chilli powder and flakes, the former is fine, the latter is coarse. 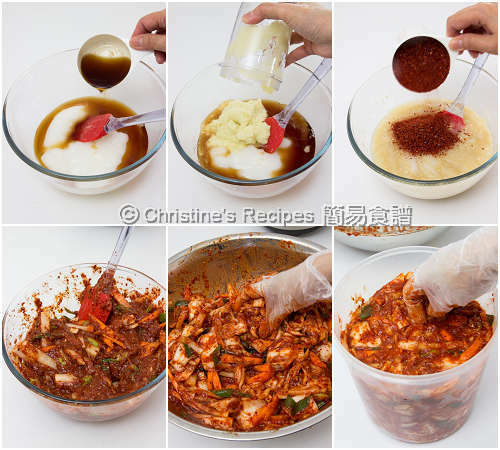 Chilli flakes is a better choice for making kimchi. The amount can be adjusted to your taste. Korean grocers or large supermarkets should carry this product. By adding radish and carrot, the kimchi will take up their natural sweetness, and taste more delicious. These ingredients are optional. Looks so authentic! Sadly...my stomach can't handle kimchi as much as I want. Is the glutinous rice flour sweet in nature as there isnt any sugar found in your recipe? Glutinous rice flour contains carbohydrates that will be broken down into sugar. But if you like your kimchi sweeter, you may add some sugar. Some people add a pear or oyster too? Hi, Christine, made this a week ago, like it very much. Can i use only cucumbers? Thanks. More or less the same. I found the Korean one is finest and driest. If you can't source it, just use the one that is handy to you. It'll work anyway. I have made this several times. It's fantastic. Thank you. I have added some dried shrimp which I toast and blend together with the onions. What else can i add? Richard. Glad that you made it several times. Yeah, some people like to add dried seafood to add umami into it. I bet your kimchi is so good. I am eating keto! No rice or grains. What could I use instead of the flour? The 35 grams of glutinous rice flour is a very small amount. If you don't even take this little amount, you can simply skip it. The veggies can still be fermented without it.